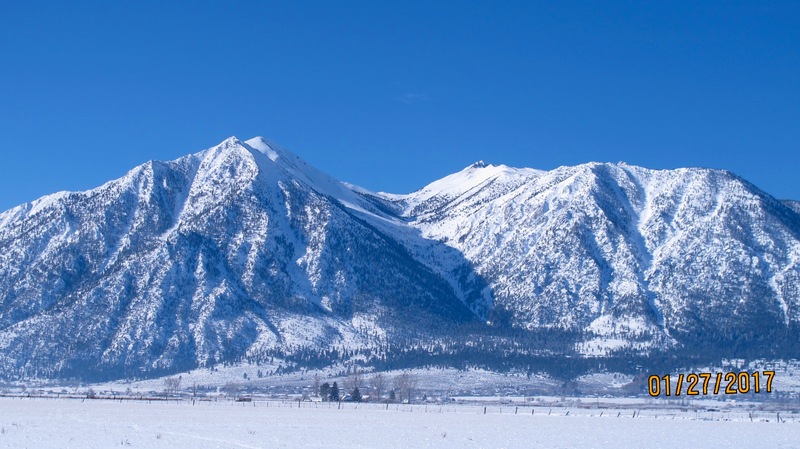 This weekend marks the 15th annual Eagles and Ag Celebration here in the Carson Valley. 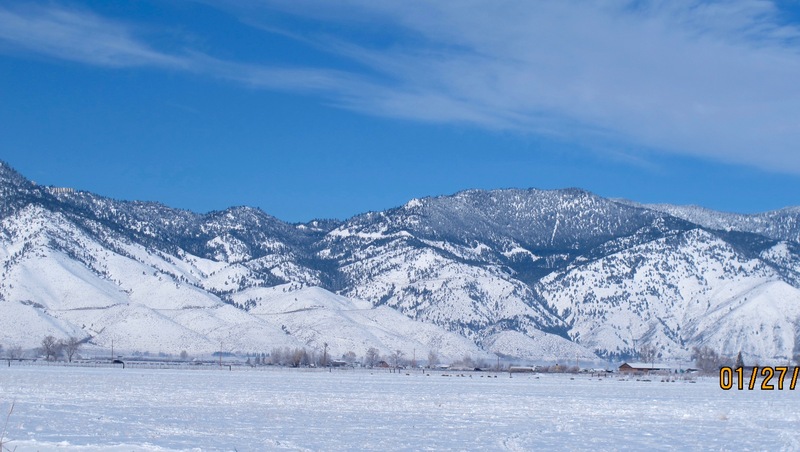 It’s a great way to see the sights in the valley along with learning about the agriculture (particularly the cattle industry) here and why eagles come here every winter. (It’s because the cattle are calving and the eagles like to eat the afterbirth, not the calves. It sounds gross, but nothing is wasted in nature.) Having been on the bus tour when I first moved up here, I decided to do my own little adventure this morning. It was great to get out of the house and enjoy the clean, crisp air. It was so great to get out and about! And I saved $70 by not taking the organized tour. 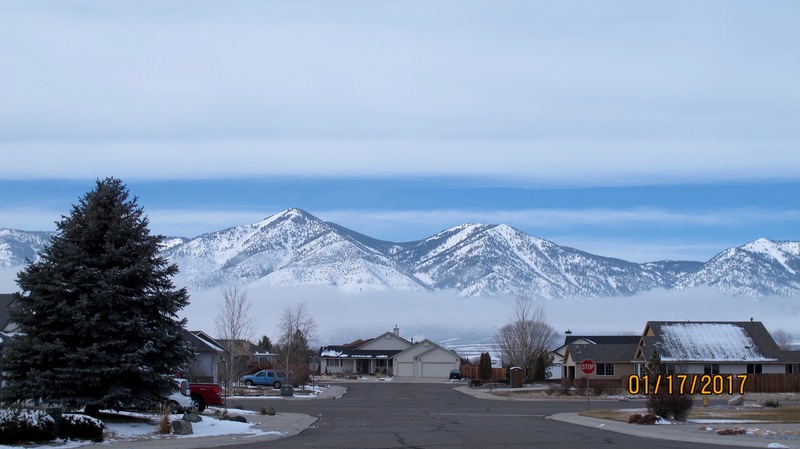 My first stop was to get this great view of Job’s Peak (on the left) and Job’s Sister (on the right). People hike up to the peaks all the time, but I never have. My hikes aren’t quite that strenuous. I turned just a little bit and took this photo of Kingsbury Grade, our primary road to Lake Tahoe. You can see the long cut leaving the valley (center left) and then another cut as it reaches the summit. There are some buildings at the top left that belong to the Heavenly ski Resort. Some ski runs are to the left, out of the picture. The next stop was at the Dangberg Ranch Home that is now a county park. H.F. Dangberg was a pioneer rancher beginning in the 1850s. He and his family began the town of Minden. I have probably mentioned this before. But today, it was the place where I saw a bald eagle almost up close and personal. 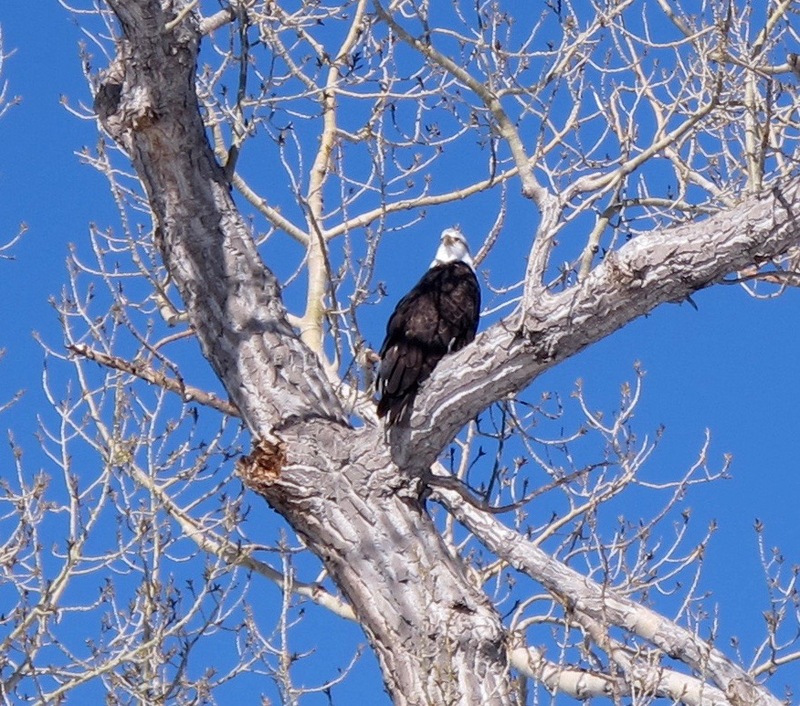 He was so majestic sitting in his cottonwood tree. The Reno CBS affiliate was there doing a commentary on the Eagles and Ag celebration while I was there. I was close enough to hear the reporter and how many times he started over his comments. I don’t think I’d like that job. I happened to be watching the CBS News last night and saw the segment those folks were recording. I was in the photo for about three seconds as they caught me while I was taking a picture. For three seconds, I was a star! As I mentioned, it was pretty chilly and when it’s like that, one can often see pogo nip. 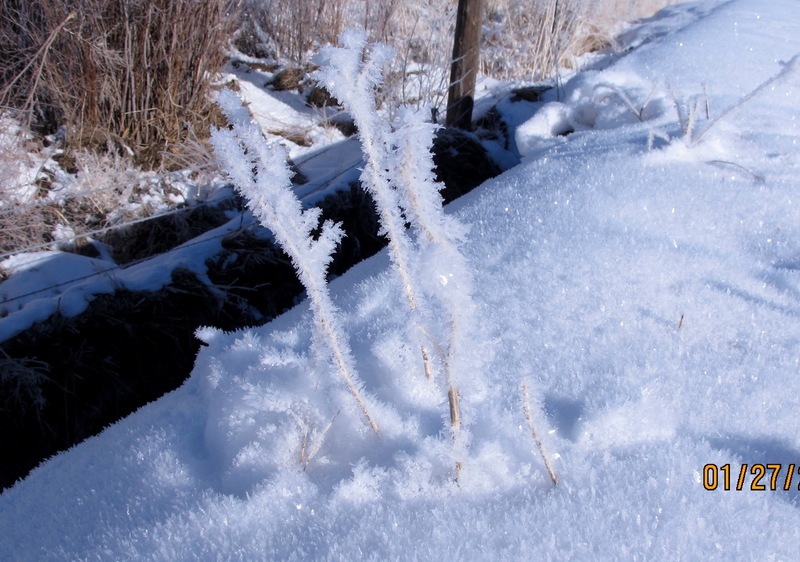 It makes beautiful ice crystals on plants, fences, trees, telephone lines and many other objects. It also makes the snow sparkle like millions of diamonds are strewn across it. 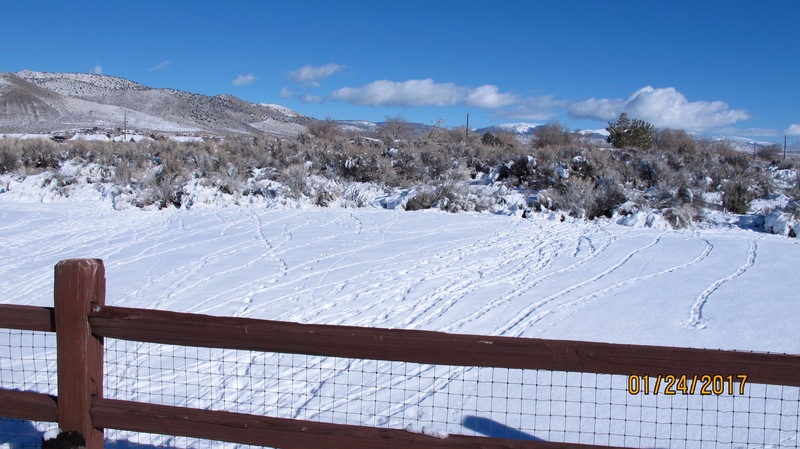 The Park Ranch, a very large cattle ranch, surrounds the Dangberg Ranch Home and one must drive on an easement through a portion of pasture to get to the Dangberg. There was a nice sized herd of cows with many calves and I happened upon a little doggie that was separated temporarily from his mom. He wasn’t six feet from the car when I took his portrait. She had already crossed the creek in the background and he wasn’t quite ready to do that yet. I don’t think he was more than a week old, maybe two weeks. 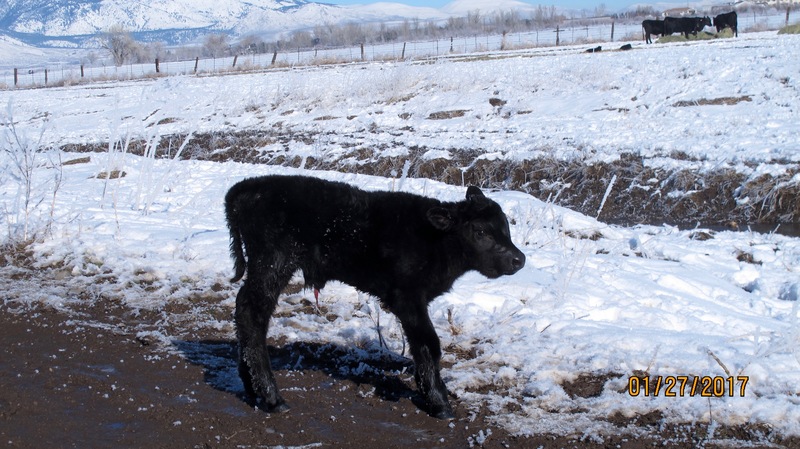 I always feel sorry for these calves that are born when it’s so cold. Their moms drop them into snow and they must get up right away and start moving or they might not make it. My last stop was in Genoa, home of the suicidal deer. 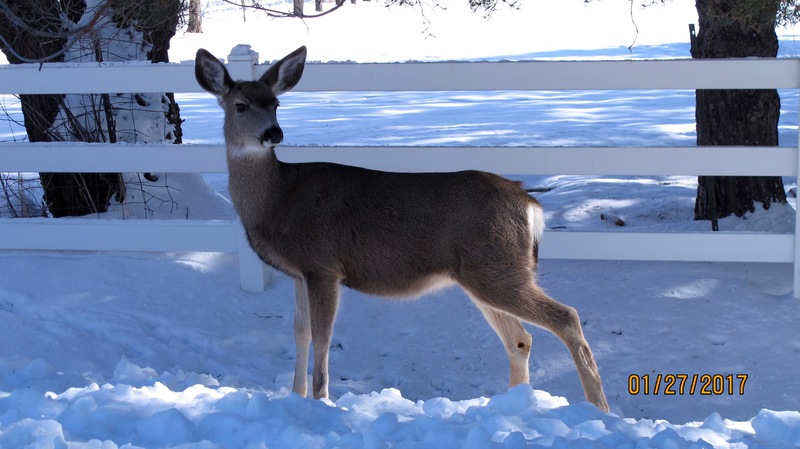 Genoa is situated at the foot of the Sierras and, for some reason, has become the home of many, many deer that live in town. They cross the main street at will, cars stop and people like me take pictures. 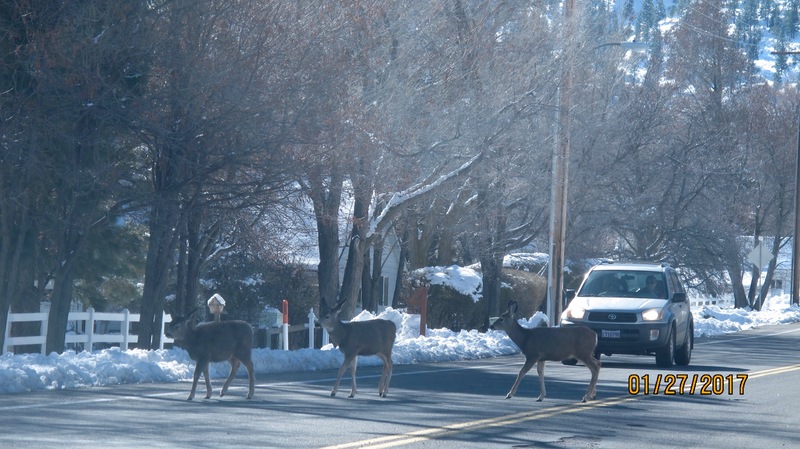 I counted 21 deer in less than 10 minutes of being in town. I just rolled down the window and took this photo. 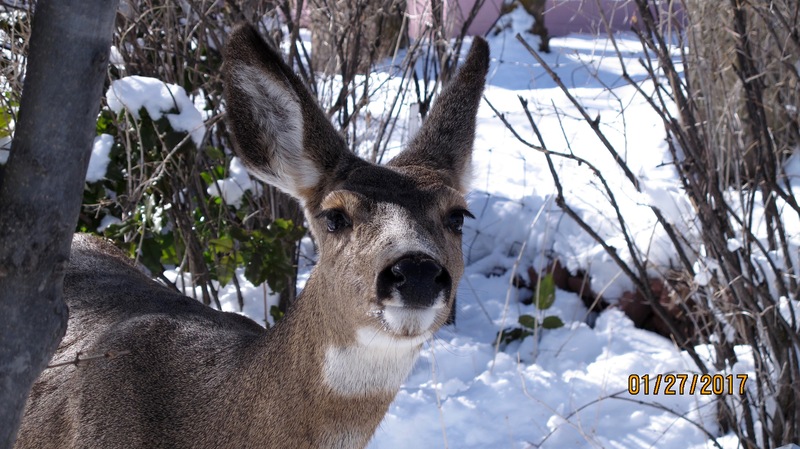 Friendly deer in a person’s front yard. 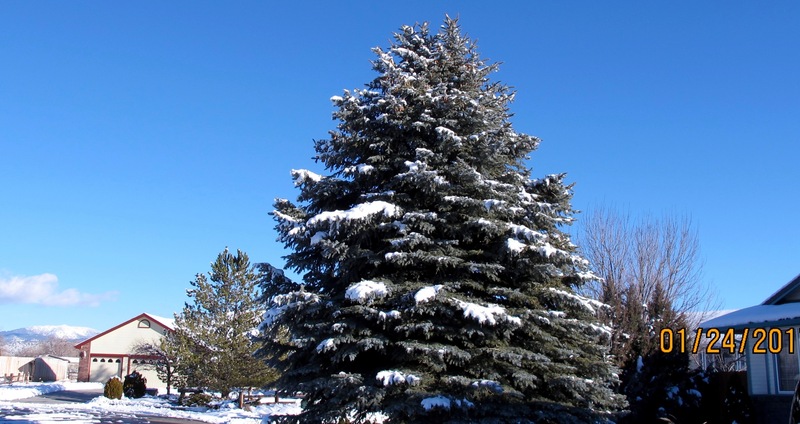 If you follow Buzzard Notes, you have seen this spruce many times in pictures of the mountains. It’s on the corner of my tiny cul de sac. It is the nightly home for many, many quail and I don’t know how many other birds. You can see they don’t have to go far to my house, the one with the dark red trim. 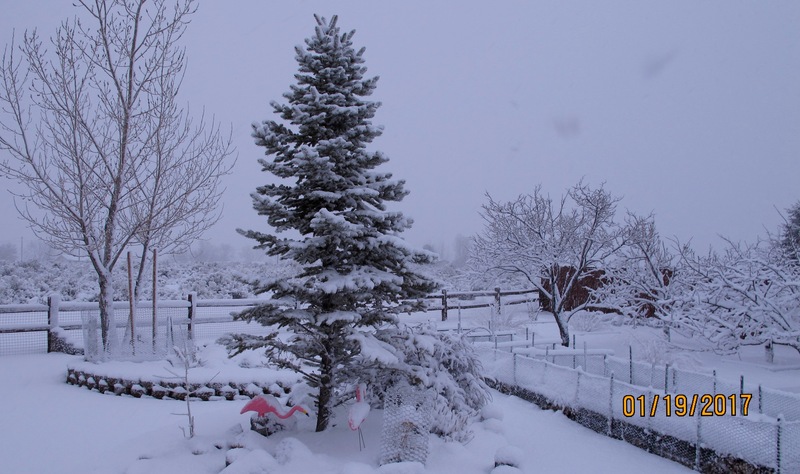 There is a large juniper under that large covering of snow. Many cottontail rabbits live here and perhaps some birds as well. But I think they like to be in trees at night to avoid coyotes and other hunters. When the time is right in the morning, the head quail says, “Let’s go,” and they begin their trek to my place. They run from their tree to bushes and then other trees along the way. These birds usually go by the south side of my house and from my kitchen window; I have counted a steady stream of more than 40 on several occasions. It’s very interesting to watch. I call this the gauntlet because the quail must run about 30 feet from the sagebrush to the fence. 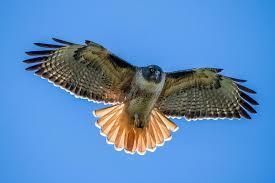 This is prime time for a hawk to zoom down and catch one. You can see on the right, a trail that seems to stop. The bird might have become alarmed and turned around or taken flight to relative safety in my yard. More tracks from the fence to the feeding area. That dark lump a short way from the fence is a seed block. It’s about 12 pounds of compressed seed that the birds, squirrels and rabbits like. 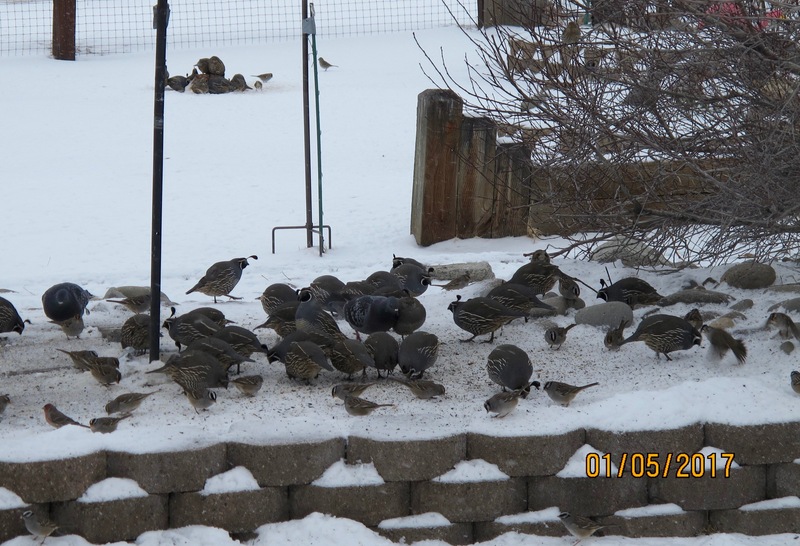 Most of the birds like the loose seed to pick up at the feeders or on the ground. After the spruce tree quail come in the morning and feed, they tend to spend the rest of the day out in the sagebrush. 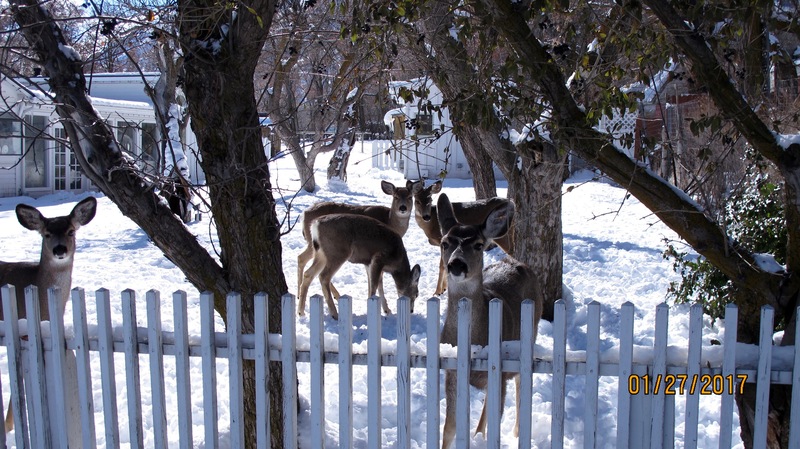 I guess they like to spend time with their sagebrush cousins. Everyone comes en mass just before dusk to get enough to tide them over to morning. Then, just at the right shade of darkness, someone says, “Let’s go,” and they all fly over the house back to their tree. The sagebrush quail go back to their respective homes. Cottontail rabbit tracks. No, he didn’t have three legs. That’s just part of their gait. Sparrow tracks. I think they like to spend time in the juniper in the background. 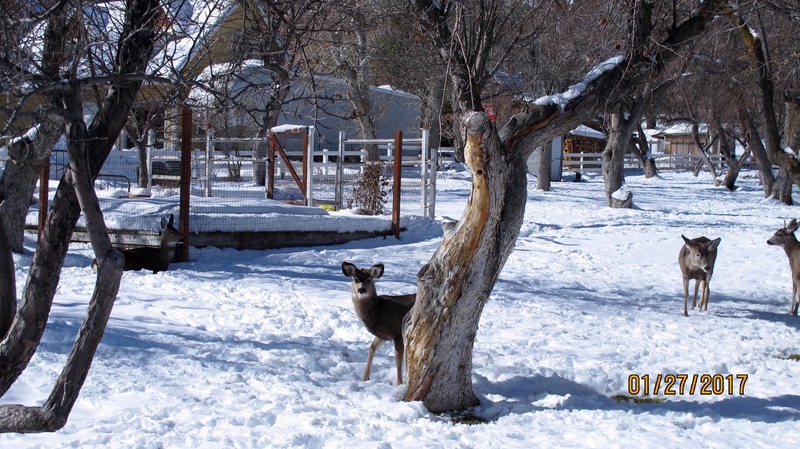 They like to eat at the feeders and also spend a lot of time of the ground, eating what has been spilled from the feeders. Taken about 8:30 yesterday morning. We had a storm the night before and the sun was trying to shine its way through the clouds. It was so pretty to see. There are some goldfinches on the seed sacks and sparrows on the ground. 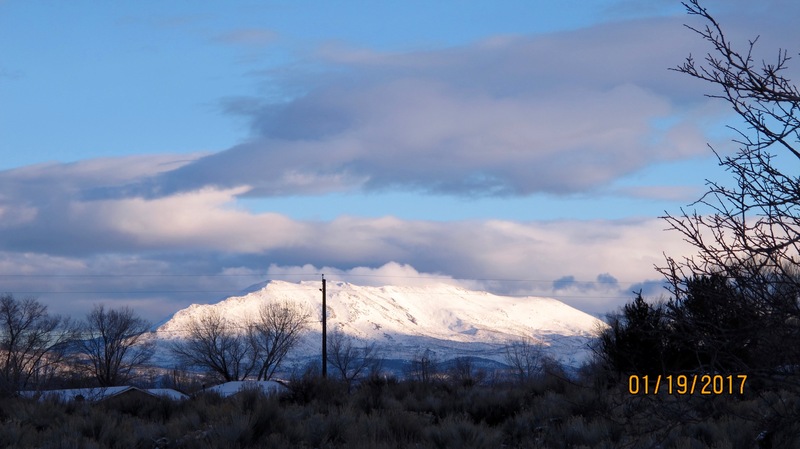 If you look closely toward the sagebrush, there are no tracks coming across the snow. 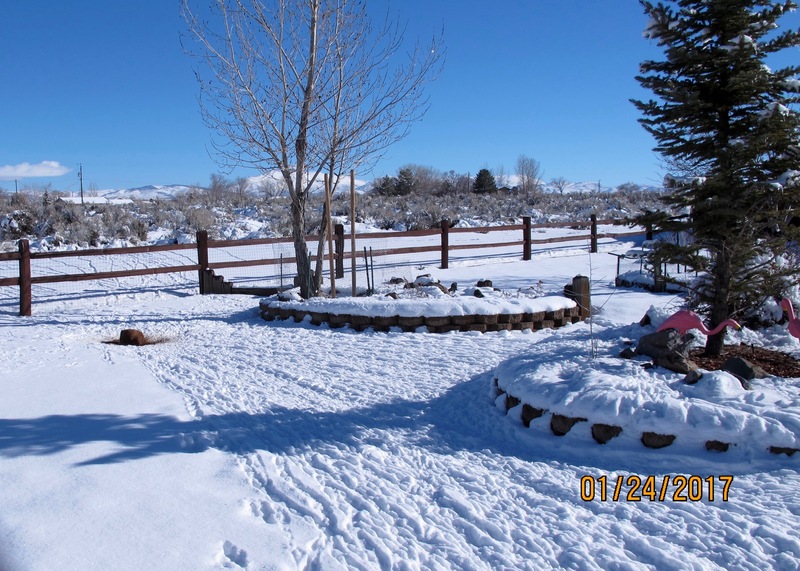 The quail slept in yesterday until it warmed up a bit. They were late this morning also. I don’t blame them. 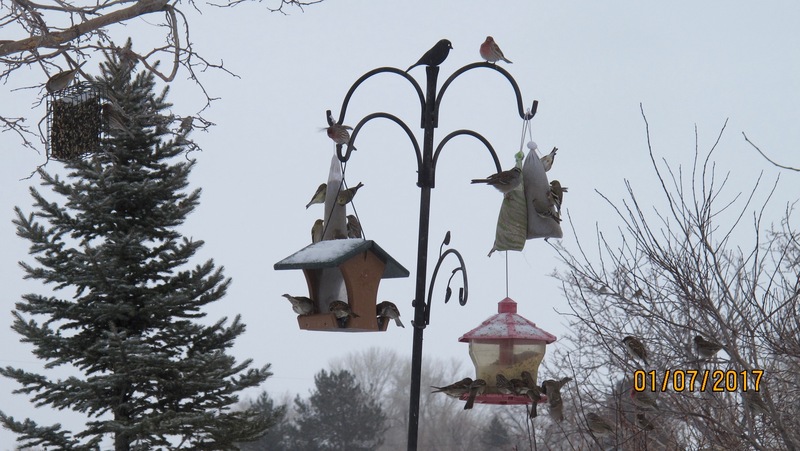 It was 18º when I filled the feeders this morning. It rained most of yesterday and the wind was howling last night. 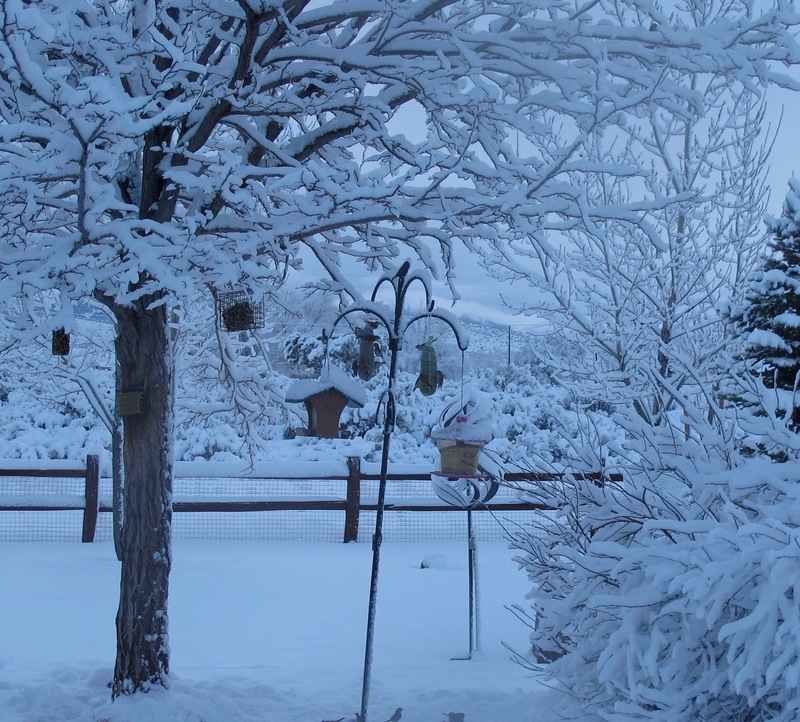 I was surprised to walk out into a snowstorm when I went out to feed the birds this morning. You can see there are some pretty cold flamingos here. Notice you cannot see much beyond the back fence. The snow was blowing in from the south and that is why the fence and trees are plastered on one side with the snow. I was scheduled to give a tour at the Museum this morning and thought twice about shoveling my driveway. It is three cars wide and I generally shovel only half to be able to get the car out. It takes quite a bit of effort to get just half done. It did get done and I zoomed off to Carson City about 9:30. It had quit snowing for a bit and it was brilliantly sunny. The highways were good and there were no traffic problems. The museum tour was good and the kids were well behaved. I like it like that. It rained and snowed on my way home but it looked like the storm was done for the day. This is one of my favorite late afternoon views. This is looking east toward the Pine Nut range and is basically the same view as the second picture above. You can see a shadow of the Sierras as the sun begins to go behind the Sierras in its setting mode. Quite often in the various seasons, the sun highlights the Pine Nuts giving them many different hues and appearances . A zoomed in view of the Pine Nuts. Jerri and I take our RAZR up in these mountains to cruise on the mountain trails. 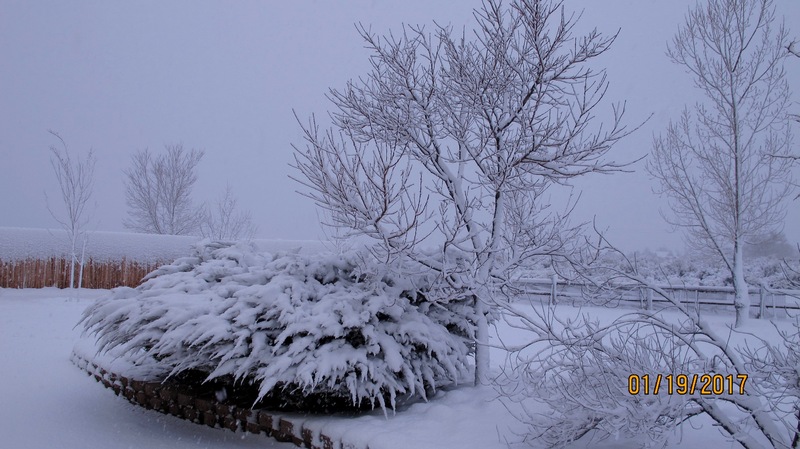 We’re expecting another storm early tomorrow morning that will give us more snow and then another on Sunday. 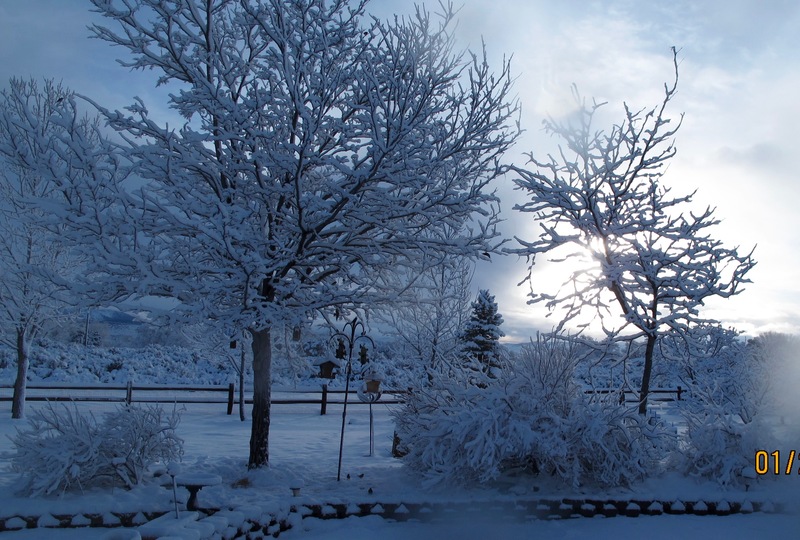 We love this snow as the snow pack in the high elevations is growing and we like that. I might feel like I can take a longer than three minute shower this coming summer if this snow pack continues to grow. 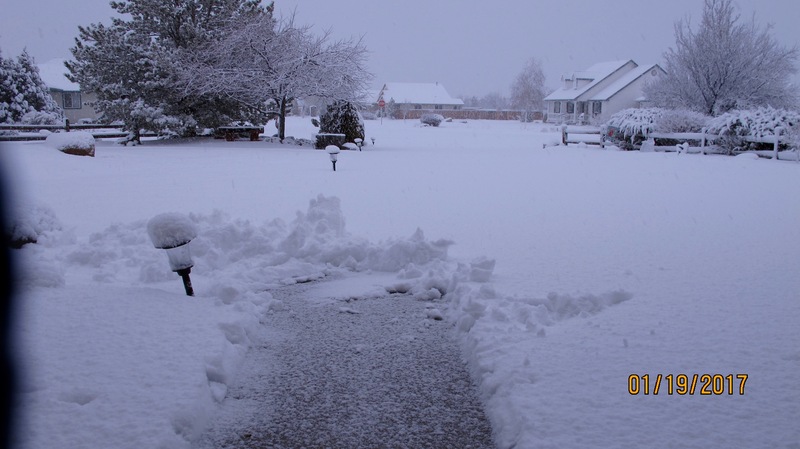 Just a few days ago, I was lamenting the loss of snow due to the warm Pineapple Express rains. Then new, much colder storms moved in and have not only replenished the snow levels but also surpassed what it was a week ago in some areas. Lake Tahoe has risen a foot since January 1. All told, it’s the wettest January since 1893. Skiers are lamenting that they can’t get up to the new snow because the roads are closed, but that will change in the next few days. We’re supposed to have a very nice weekend that might even be up in the 40s. There has been some flood damage in our valley as well as in Reno and outlying areas east of us. I’ve been reading about northern California also sustaining quite a bit of damage. BUT, I’m blessed with only a few inconveniences and am free to enjoy today and all its beauty. This was taken this morning. There are no birds because there is a sharp-shinned hawk in the tree to the right of the feeding area. This is the flood channel just a block fro my house. The reason I’m here is because I had to take a letter to the mailbox that is by this location. 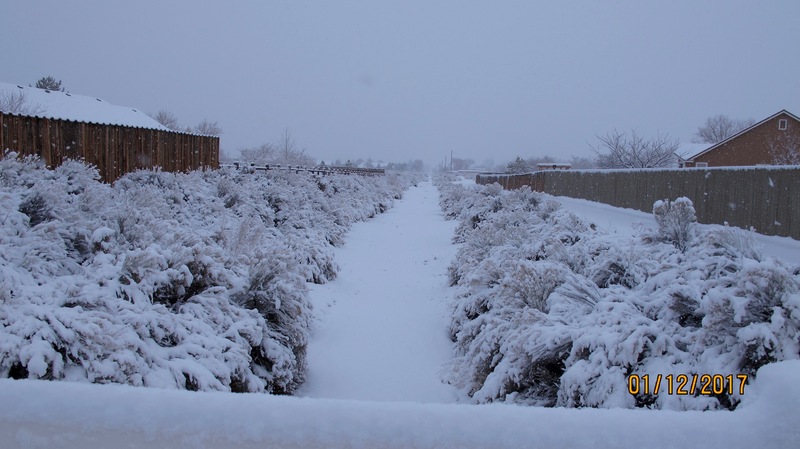 I love how the snow sits on the sage and rabbit brush . 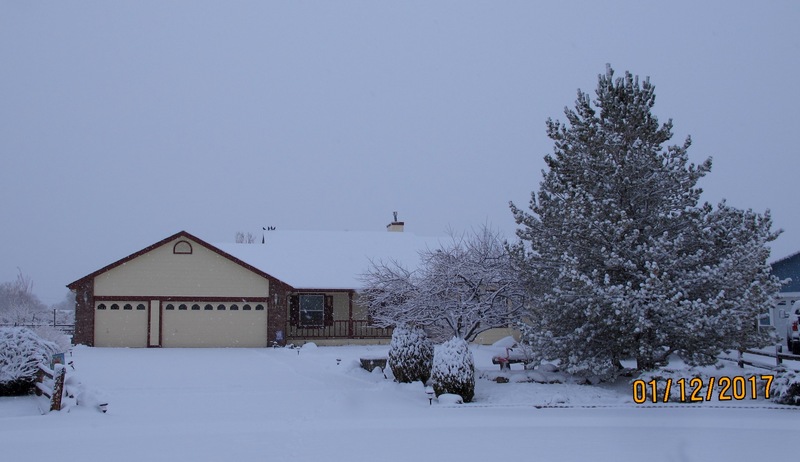 The first picture of my house in the snow. 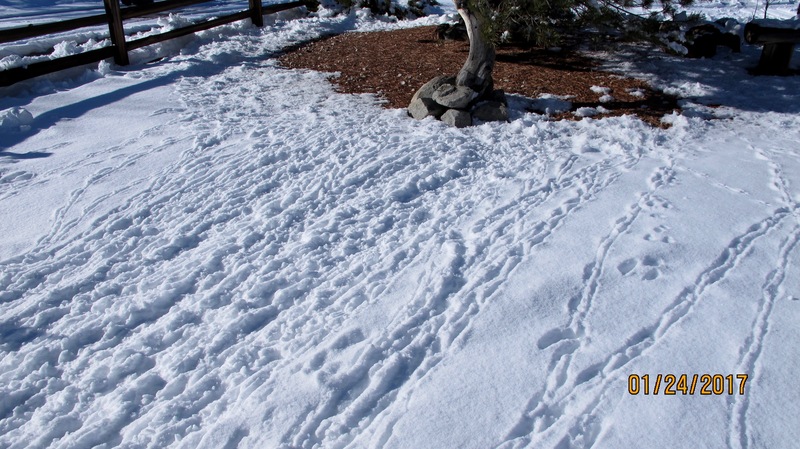 It’s kind of neat to walk around outside a bit and see tracks of rabbits and birds foraging for a meal. 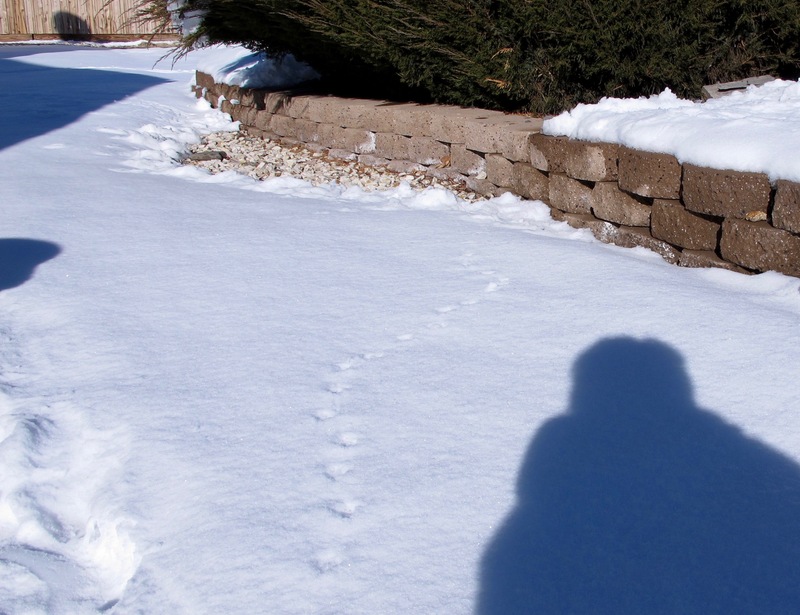 Earlier, I saw a coyote taking a stroll outside my back fence. 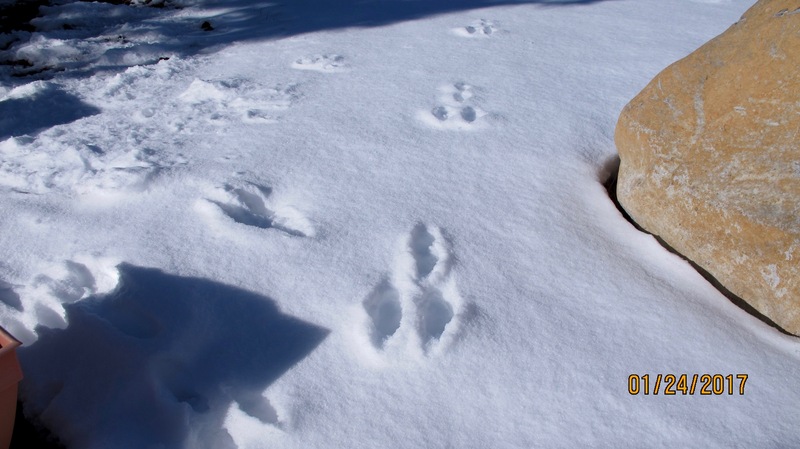 No, I didn’t go out to see his tracks and now they’re covered up. It’s a great day to be inside and watch the falling snow. As you can tell, I’m get much done today that is constructive. 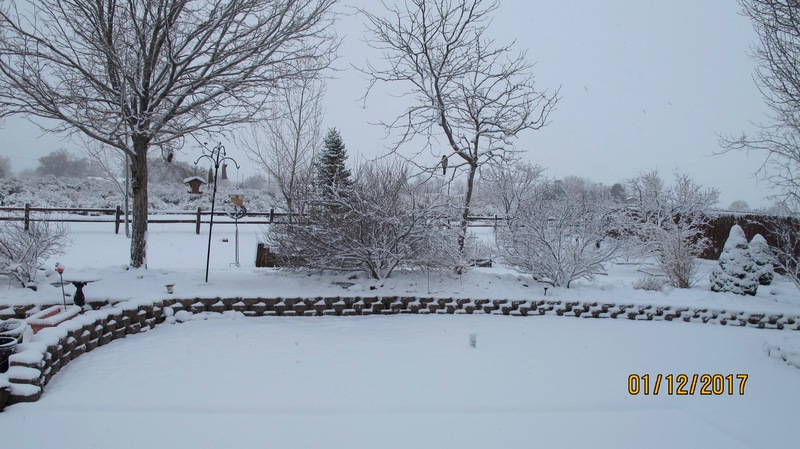 Jerri tells me that our dad loved to watch the snow. I guess I’m pretty much my father’s daughter. The storm happened and it rained all day this past Sunday. It was very warm that day, in the high 40s. The rivers rose, as predicted, and caused flooding and evacuations. You may have seen some news clips on the national news. Those clips were mostly in Reno, but there were scary events in our valley too. A bridge on Highway 395 (the main highway in the valley) was breached and 395 was closed in both directions. 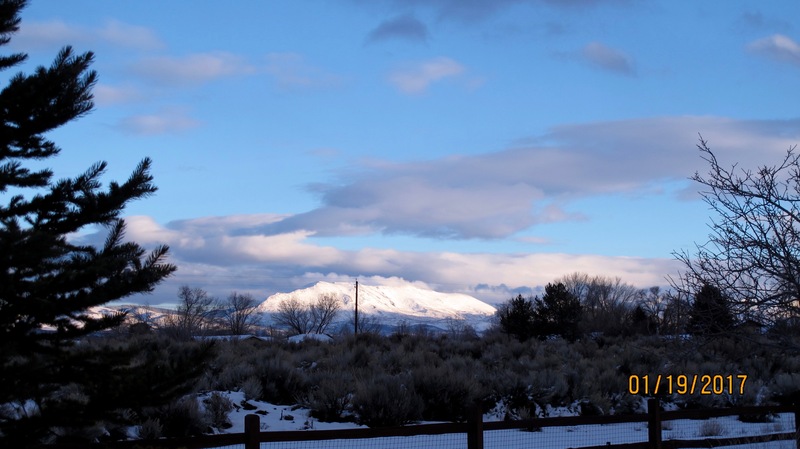 My sister, Jerri, was coming home from Carson City, a trip that normally takes 15 to 20 minutes, and it took her about an hour and a half. She was in bumper-to-bumper traffic for many miles and had to go through a miles-long area where the river was rolling across the road. Even with these issues, I am high and dry and so is my family. We have been blessed. As far as I know, no one has been killed or hurt. A lot of preparation went into anticipating this event. I think our first responders and regular citizens can be proud of their efforts. Today, 395 is open to northbound travelers. You can to Carson City but can’t get back without the long detour. Needless to say, I’m staying home, doing chores that I never want to do. In the blast blog, I mentioned that we were awaiting more storms. That is still true. But here is the good news. These new storms are coming from the regular course that brings snow to the mountains (and maybe here) and generally rain to us. So my doom and gloom about the snow pack was for naught. (I hope) We’re supposed to get some strong winds but they haven’t materialized yet. I’m glad because one of my trees in back is listing and our 90 mph winds wouldn’t help it. Oh well, it is what it is. 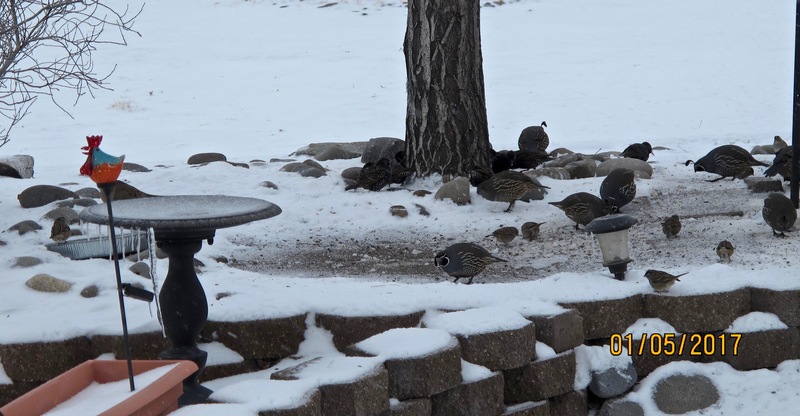 As you can see, the snow and ice is all gone, but the quail are still here for their daily rations. I was just checking them a few minutes ago when I noticed my wrong-way mockingbird was chowing down at the suet cake. I say wrong-way because mockingbirds are not normally in northern Nevada. But this guy has been here off and on since just before Christmas. About two minutes after the above photo, a red-tailed hawk swooped in and almost caught one of the quail. I might have gotten a picture of him swooping in, but I was entranced with watching the drama unfold. The quail scattered and ran under the bush to the right of the first photo. They stood stock still, waiting. The hawk perched and waited too. 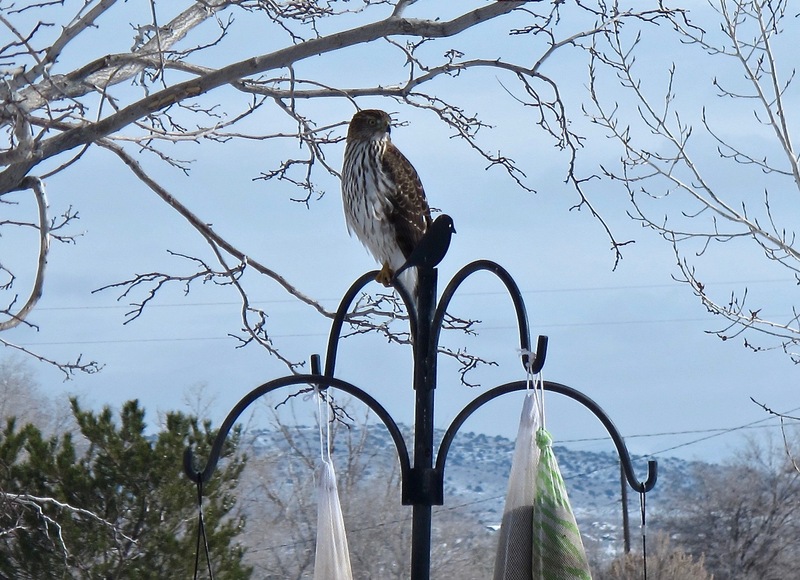 Eventually, the hawk decided pickings would be better elsewhere. As soon as he flew off, the quail were back pecking at their seeds. It’s an interesting event to watch. I wish I could figure out who gives the alarm. They just seem to know exactly when to move quickly to safety. Dad always said their call was “Cuidado!” which means, “Be careful!” in Spanish. There is never a dull moment in this backyard. I hope this epistle finds you all doing well with the weather these days. It’s been crazy (except for friends in Maui) but it makes life interesting. Quail, white crowned sparrows and a couple of those winged rats (pigeons) can be seen in this picture. Often, there are so many quail that it looks like the rocks and pavers are moving. I’ve counted up to 40 and then lost track because they are constantly moving and pecking. American goldfinches (mostly on the thistle bags), some sparrows and a couple of house finches grace this picture. There is one bird in the pine in back. It makes me think of my mom who always said they were ornaments on her spruce tree. Here is a juvenile Cooper’s hawk. He’s the party spoiler. The smaller birds scatter to the four winds and/or huddle under the bushes beside the feeding area when the alarm is sounded. When he catches something, he eats it right away and nothing is left except a pile of feathers. Sharp-shinned hawks come by also and perch in the trees in hopes of catching an unsuspecting victim. 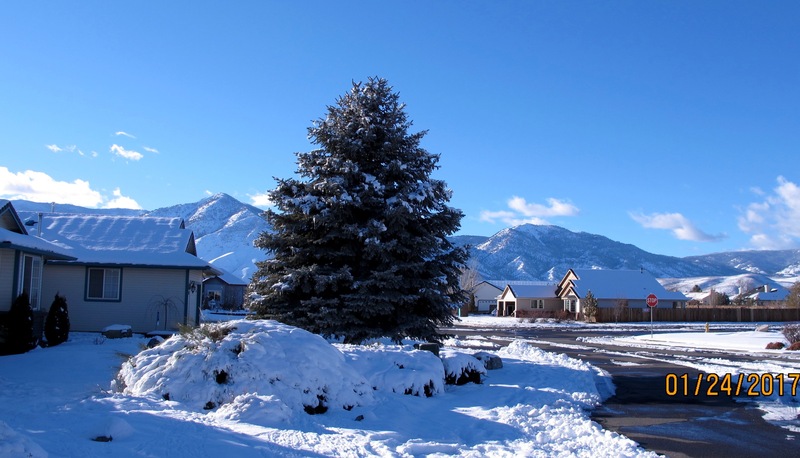 You might have read about or experienced our weather we are having this week. We had rain and snow and some very cold temperatures. As I write this, it is 20º outside, going up to perhaps 30º this afternoon. I couldn’t get my mail yesterday as my mailbox lock froze and I was afraid the key would break if I forced it. 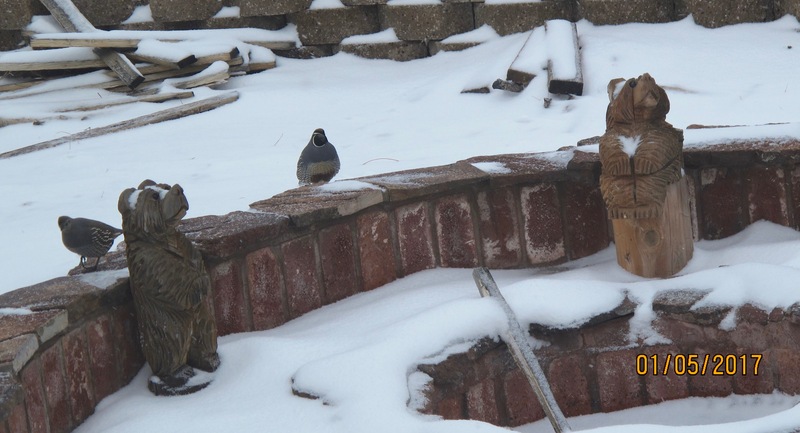 So, with it being so cold, I was sure that my birds needed some extra fuel to keep them warm. 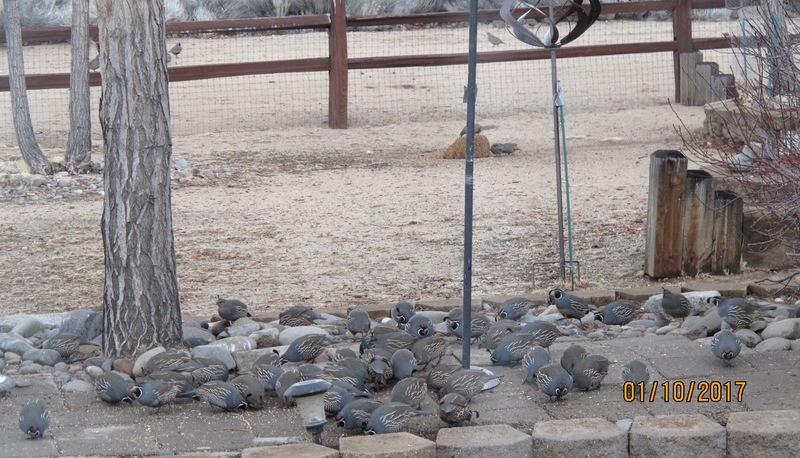 The quail and other ground feeders got an extra ration of deluxe seeds. An extra seed block was put out near the fence. The quail like that as well as the small white-tailed antelope squirrels (they are cute little varmints) and cottontail rabbits. I didn’t know rabbits would eat seeds, but they seem to enjoy gnawing on the block. Perhaps that helps to keep their teeth in good shape. Who knows? You can see icicles hanging from the frozen birdbath. A bird is perched on the metal tin in back of the birdbath to get a drink of fresh water that I put out each day. It’s frozen by nightfall, but you’d be surprised that those silly birds will take a bath even when it’s so cold. In front of the two wooden bears, is a sunken fire pit that was half full of water the last time it rained. That water froze and then melted enough so that I could get the ice out. I’ll tell you why shortly. 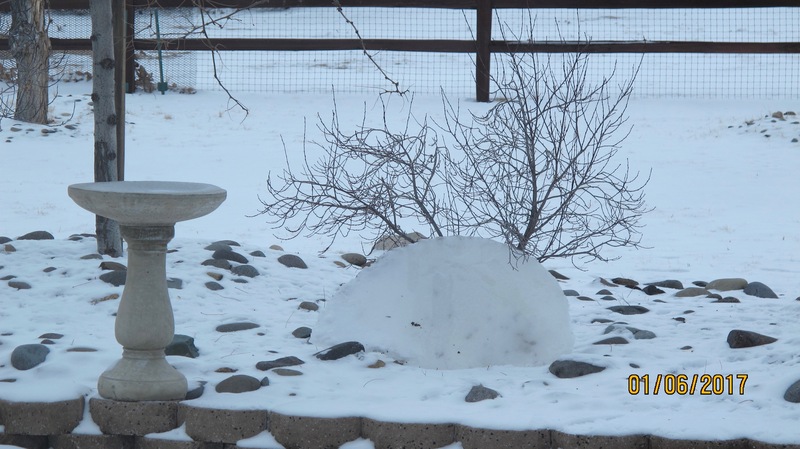 Half of that ice is sitting behind the other birdbath. It’s been there for a couple of days and has not diminished in size. I began this epistle last Thursday and it’s now Saturday. Our valley as well as Carson City, Reno and basically from Mammoth north is under flood alert. A Pineapple Express (an atmospheric river of warm rain) will be arriving tonight and our temperatures will be going from the 20s to the high 40s. You can begin to see an issue here. I know that California is supposed to be getting a ton of rain from this and we are too. The problem for us is that the forecast calls for rain up to 9,000’. This means snow will melt and in a couple of days cause our rivers to flood. A severe Pineapple Express occurred in 1997 and caused millions of dollars in damage. Another one (not as severe) happened in 2005. I removed the ice because I wanted the fire pit to be as empty as possible. The water usually soaks in in a day or so, but our ground is fairly saturated and I’m afraid it’ll run over toward the house. I don’t know that for sure because I wasn’t in this area during the last flood. But two summers ago, it poured and poured and the fire pit did overflow. Just trying to be cautious.